Brussels, 4 June 2014 - The Voluntary Emissions Controls Programme (VECAP) of managing chemicals celebrates its 10th anniversary this year. VECAP aims at reducing emissions of brominated flame retardants (BFRs) through the promotion of environmental and process best practices throughout the value chain, from producers to downstream users. The Programme's latest European Annual Progress Report, launched today shows a reduction in potential emissions of flame retardants to the environment over the past five years. ‘Ten years after the launch of the programme, VECAP remains an integral part of environmental best practices among engaged companies. Participation continues to be high: 2013 survey covers 93% of the total volume of the four common brominated flame retardants sold by the EFRA member companies involved in the programme. We are committed to increasing the number of user sites participating in VECAP within the next 18months.' says Danielle Goossens, Programme Director. This year's progress report shows that potential emissions of the three flame retardants surveyed over the course of the years have significantly declined. In most cases potential emissions reached default values, meaning that they are showing the lowest readings achievable when applying the Best Available Techniques described in the VECAP tools. The 2013 report also showed negligible potential emissions to land for Hexabromocyclododecane (HBCD), demonstrating that it is possible for the programme to help users reduce or avoid emissions to land. Testimony to the success of the scheme is the responsible disposal of the waste generated by users for the full volume of Tetrabromobisphenol-A (TBBPA), Decabromodiphenyl ether (Deca-BDE) and HBCD, showing the industry commitment throughout the value chain, from the production to the disposal phase. 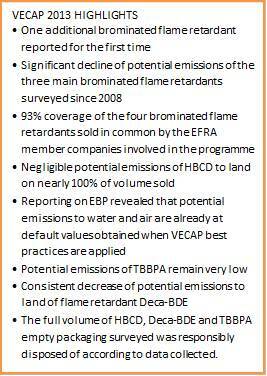 2013 also marked the first time reporting of EBP which revealed that potential emissions of flame retardants to water and air are at default values obtained when VECAP best practices are applied. Participation in the programme was already high among EBP users, covering 87.1% of the volume sold, and sets a good starting point for implementation and future reporting. Over the decade, the scheme run by EFRA (the European Flame Retardants Association) has grown into a truly global product stewardship programme operating under the tenets of Responsible Care® to manage safely chemicals, above and beyond regulatory requirements. The positive results in the 2013 report confirm the high level achievements of the programme and encourage continuous improvement in the future. The VECAP team will continue to focus on the distribution network to enhance collaboration with second-line users and on the expansion of the programme to involve new suppliers and cover additional substances. "VECAP is an example of how voluntary initiatives can respond to concerns without the need for strict regulatory measures."